ORTELIUS - Cenomanorum... La Mans. / Neustria. Britanniae, et Normandi. 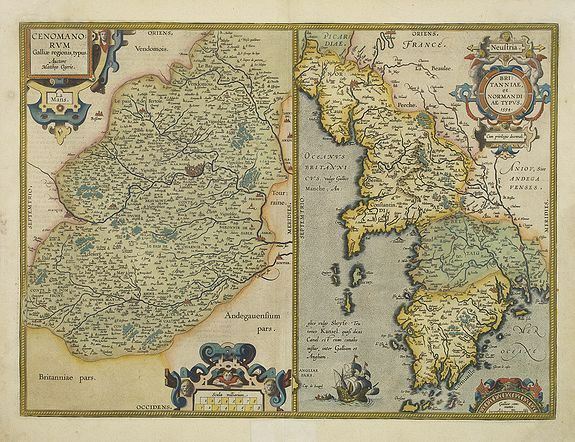 ORTELIUS, A. - Cenomanorum... La Mans. / Neustria. Britanniae, et Normandi. Cenomanorum... La Mans. / Neustria. Britanniae, et Normandi. - ORTELIUS, A. Title : Cenomanorum... La Mans. / Neustria. Britanniae, et Normandi.. Size : 14.8 x 19.9 inches. / 37.5 x 50.5 cm. Description :Two regional maps of France. Depicting to the left, the region of Le Mans, also known as Civitas Cenomanorum (City of the Cenomani), and to the right the regions of Brittany and Normandy. Condition : Paper age-toned with some marginal water stains. Else good condition.